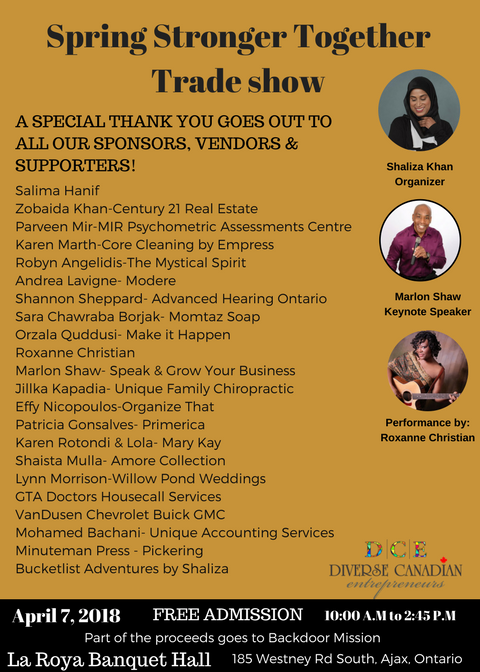 VanDusen Chevrolet Buick GMC is proud to sponsor the Spring Stronger Together Trade Show hosted by Diverse Canadian Entrepreneurs. This event will be held at La Roya Banquet Hall on April 7, from 10am to 3pm. Come on out and visit the VanDusen team at our table. Admission is free. Part of the proceeds will go to the Backdoor Mission. These events are held by Diverse Canadian Entrepreneurs to showcase our community’s local talents, creativeness, products and also allow people in our community to connect with our brand, image and the products that we carry. The goal is to involve others so that everyone benefits. You must be willing to give first and give without measuring or keeping score. These are the very reasons why VanDusen has partnered with and supports Diverse Canadian Entrepreneurs.